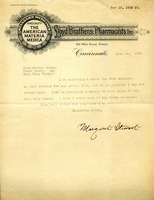 In this letter Margaret Stewart sends Martha Berry five dollars along with the letter that says she will probably not return to Cincinnati and will not send another letter from there. Mr. Hoehler tells Martha Berry that Mr. Charles P. Taft has agreed to speak at the Berry Schools next year. 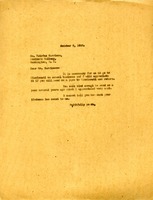 Mr. Hoehler suggests to Martha Berry that it would be a good idea to invite Mrs. Taft, as well, because he thinks she could make significant donations to the Berry Schools. Additionally, Mr. Hoehler tells Martha Berry about a new highway from Cincinnati to Chattanooga which will make it easier for Martha Berry to "cultivate" benefactors in Cincinnati. Lastly, Mr. Hoehler asks Martha Berry to ask DeWitt Littleton to write him a proposal for laundry equipment needed which Mr. Hoehler will take up with his friend Taylor Stanley as a potential donor.